New ILO Member Serving Pickering Coming Soon! A catastrophic injury is often life-altering in terms of creating physical challenges that make it difficult for an injured person to function from day to day. 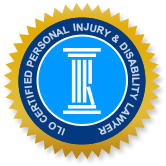 Your accident may have left you with any one or more of a number of injuries such as paralysis from a spinal cord injury, the loss of a limb, or the most common catastrophic injury, traumatic brain injury. Traumatic brain injuries can impact one’s ability to work regardless of years of experience or training and best efforts. As a result, victims may no longer be able to earn a living in their chosen field, and in some cases, not at all. If you or a loved one have experienced an accident that left you with a traumatic brain injury the negligent party must be held responsible for compensation for your injuries. According to the Northern Brain Injury Association of Canada, the most likely injury to cause permanent disability or death is a traumatic brain injury. Canadians are over forty times more likely to suffer a brain injury than a spinal cord injury. Brain injury is more common than many forms of cancers including breast cancer, as well as other conditions that receive significant public attention, such as HIV/Aids and Multiple Sclerosis. There are over 165,000 cases of traumatic brain injuries in Canada each year, one every three minutes. Untreated brain injuries often lead to self-medication with substances such as prescription pain medication, illegal drugs and alcohol, and in some cases, abuse of these substances and crime. The major causes of traumatic brain injuries in Pickering and other areas of Canada are motor vehicle accidents and slip and fall accidents. In an automobile collision, there is no sure protection for head trauma. An external blow to the head is not the only cause of catastrophic brain injury; the violent impact alone of two motor vehicles colliding causes the brain to actually bang around inside the head similar to the action when a boxer is punched in the head repeatedly. This action can cause brain swelling and bleeding and is almost always accompanied by severe, "migraine-like" headaches. If you have been involved in an automobile accident that has resulted in frequent, recurring headaches and neck pain, and you suspect negligence on the part of the other driver, your ILO traumatic brain injury attorney can determine if you have a case for damages. In Pickering, slip and fall accidents that happen on another person's property, in a store, or in a parking lot may also cause traumatic brain injury. Falling down stairs where the handrail was broken or loose, tripping on worn or buckled carpeting or slipping head over heels on wet slippery surfaces in stores, on sidewalks, and in parking lots may result in significant injury when an individual’s head violently hits the hard surface. Property owners can be held accountable for their negligence when failing to maintain their property in a safe manner for their customers, visitors and for the general public. If the negligence of a person or facility may have caused the slip and fall or car accident that resulted in your injuries, you should call us today to discuss your case and determine if you are eligible to recover damages. Our Personal Injury lawyers of Ontario (ILO) law team will advise you on your options and build a strong case to obtain just compensation for your suffering, rehabilitation, medical expenses and lost wages.